What Kind of Dogs Are Good With Parrots? Always supervise interaction between your dog and parrot. Proceed cautiously when adding a canine companion to your feathered family. Some dogs may show aggression toward your parrot, others may ignore him completely. If your parrot seems overly anxious or stressed by the presence of a dog, reconsider purchasing one. Feisty and independent, terriers have a reputation for not getting along with other animals. They possess an unstoppable urge to chase anything that moves. Many terriers were bred to kill rodents or small animals. The Airedale terrier was originally used to control the rodent population in England; cairn terriers were bred to hunt foxes and badgers, Welsh terriers were used for hunting otters. This predatory instinct is so strong that terriers generally cannot be trusted around parrots or small animals. Dogs bred for guarding or overseeing livestock are even-tempered and can be trained to tolerate parrots. This group includes border collies, sheepdogs, greater Swiss mountain dogs and the Great Pyrenees. Although extremely large and weighing between 70 and 120 pounds, the Bernese mountain dog is a gentle giant who can be extremely friendly around other pets. Herding dogs have an innate drive to direct and nip other animals. Even a small scratch or bite can be dangerous for your bird, requiring an immediate trip to the veterinarian. A bird’s skin is thin and contains few blood vessels, which prevents excessive bleeding after an injury. While this can be positive, it increases the risk of infection. The majority of bacteria is not flushed from the wound by the flow of blood. Golden retrievers and Labrador retrievers are affectionate, easygoing dogs who may tolerate parrots. Animal Planet rates both breeds as “very friendly” toward other animals. When introducing your dog to a parrot, watch carefully and monitor his reaction. If your dog appears interested but easily distracted, this is a good indication the two may get along. If the dog’s attention cannot be diverted and he is showing signs of predatory aggression, such as lunging, barking and growling, remove the dog immediately. He most likely will not be a good fit for your parrot. Puppies are full of energy and tend to be rough and playful. Chewing, pouncing and nipping are normal behaviors. An adult dog is a better choice when it comes to mixing birds and dogs. They have already matured and their predatory instincts are easier to read. Regardless of breed, any dog can show aggression toward your parrot. Dogs are individuals, and each one has his own temperament. Invite a dog behavior expert to assist you in finding the perfect canine companion. 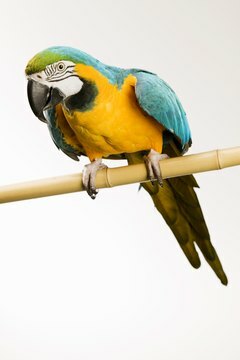 A professional can evaluate a dog’s reaction to your parrot and determine if he is a good fit for your feathered family. You can locate a behavior expert through the International Association of Animal Behavior Consultants. What Words Can You Teach a Parakeet? What Animals Get Along with Parrots? What Are the Healthiest Things You Can Feed a Parrot?